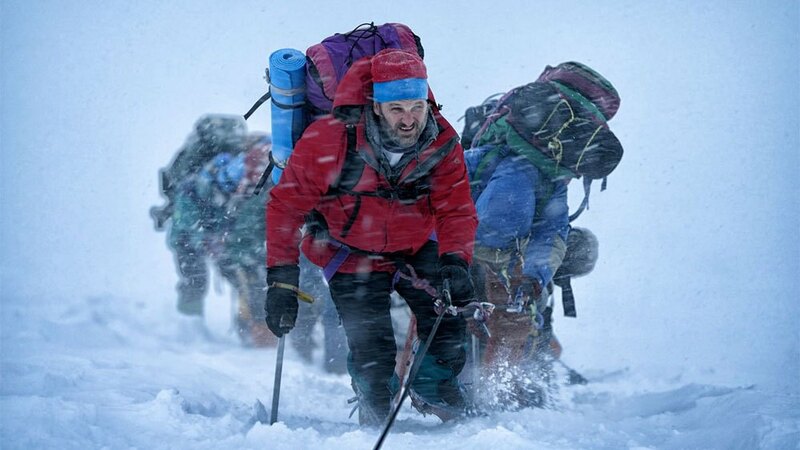 Based on the 1996 Mount Everest Disaster where several climbers lost their lives, director Baltasar Kormákur (‘2 Guns‘) shows us what happened in those days that led up to that horrifying experience. I consider myself a little bit of a daredevil here and there. I love to bungee jump whenever I can, although I admit it’s been a while since I have, but I don’t think I have the guts to climb a mountain like Everest, which is the tallest mountain on the globe at almost 30,000 feet in the air. But year after year, people trek out there and climb it and succeed, where others don’t. ‘Everest‘ plays out like two separate films.The first half introduces us to our climbers in 1996, including a doctor from Dallas Beck Weathers (Josh Brolin), a mailman Doug Hansen (John Hawkes), journalist John Krakauer (Michael Kelly), and Everest guides Rob Hall (Jason Clarke) and Scott Fischer (Jake Gyllenhaal), who implore to their civilian climbers that they need to rest up and train their bodies to weather the harsh and dangerous conditions of climbing Everest. The guides even tell them that once they are at a certain altitude, their bodies literally begin to shut down and die and that it’s imperative to reach the top and get back down the mountain in a certain time frame. So in this first half, we see the bonds and the triumphs of climbing the mountain, making it from camp to camp as each climber struggles to breathe and make it higher. There are a couple of scenes that are fairly intense with swooping camera angles that look down off the mountain that would make anybody feel dizzy and hold onto their seat arms. However, the turning point here is once several climbers reach the glorious peak of Everest and start their descent down, when a bad storm hits ferociously upon the climbers, which ultimately kills several people off. This second half is so intense and packed with a mighty sound from the IMAX speakers that I literally thought I was in the middle of this storm as well, and found myself bracing the seat in a panic. It almost seems like these people were on another planet, as most of us have never seen terrain or weather like these people experienced. Since this is a true story, we all know what happens, and it’s heartbreaking to watch the inevitable as Kormákur shows us the final moments with each climber and the base camp notifying their families. Towards the end of the film, this aspect seems to drag the pace of the movie down and goes on a bit too long, but some might think it’s a nice and refreshing breather from the chaos that came before it. Kormákur did an excellent job with his camerawork here, making us feel like we were actually on top of that mountain, in addition to giving us enough time with each key player here, although we center mostly on Rob Hall and Josh Brolin most of the time, which is unfortunate, because Gyllenhaal’s character of Scott Fischer seemed to be more interesting and conflicted than anyone else, but he’s a side player here. I’m not sure why the film was in 3D, as nothing really popped out, other than the depth of the land, but the IMAX screening was fantastic as well as the roaring sound. 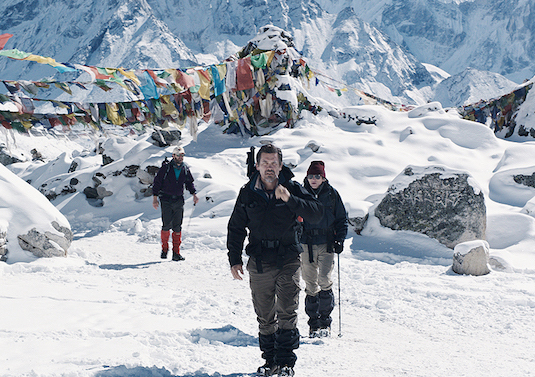 ‘Everest‘ is intense as hell and reassures me that I’ll never want to climb that mountain. Film Review: ‘Kidnapping Mr. Heineken’! This entry was posted on Wednesday, September 16th, 2015 at 9:03 am	and is filed under Film, News. You can follow any responses to this entry through the RSS 2.0 feed. You can skip to the end and leave a response. Pinging is currently not allowed. « ‘The Divergent Series: Allegiant’ New Trailer Is Amazing!!! Until then, until then, you are Mike Lowrey, you be him, that's what you are, you're him. You're him, I don't wanna hear it, you're him. And you, you're you, you be you, but not in front of her. You're him, you're you.